Recently our founder, Steve, was thumbing through some of his natty grandfather’s vintage four-in-hands that he inherited. Steve loved the unique patterns, but not the wide, dated shape. He questioned what other folks did with the great Brooks Brothers, Hermes, and Ferragamo ties from the ’70s, ’80s, and ’90s, in perfectly good condition, but too wide to wear with a modern cut sport coat or suit. Cue the hypothetical cartoon light bulb? 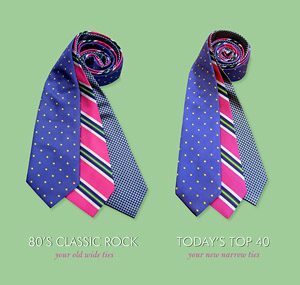 Most folks are not afforded the luxury of retaining a full-time necktie seamstress on staff, so Steve wanted Bird Dog Bay to offer a service that would transform old ties into narrower, updated versions. Just give us a few days for our seamstress to rebuild them from scratch into Bird Dog Bay’s standard 3.25″ width. We are able to offer the same service for boys’ ties. If you’d like a tie rebuilt into a boys’ length, simply note that with your shipment. Obviously, your old fatty ties. Please make sure they have been thoroughly dry cleaned. A check written to: Bird Dog Bay, for each tie you would like rebuilt. Please include $8 for shipping. A note with your name and contact information, a phone number will work just fine. A mailing address where you’d like us to ship you new beauties back to you in a few days. Please note that UPS does not deliver to P.O. boxes. If you have any questions give us a call at 312.631.3108.